Greetings, geek fans! I know that new posts have been slim as of late, but I’m in the process of moving, and a great deal of my media is packed away. That won’t stop me from still making contributions and keeping you entertained. Besides, I’ve still been acquiring new retro toons to post on once life settles back to normal. Until then, I thought I’d feature another character crush that’s been on my mind. Prepare for trouble! Er, let the geeks begin! 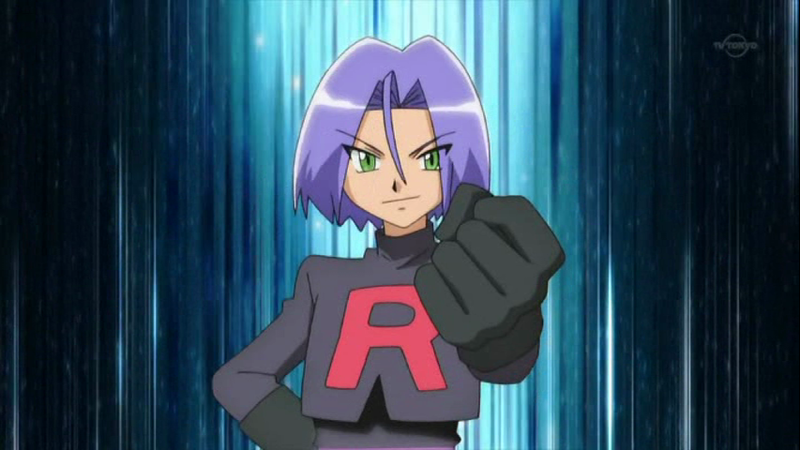 As you’ve figured out, this particular crush is on one half, or one third depending on who you ask, of Team Rocket. James has been around since the second episode of the anime, where we were initially led to believe that he and Jessie were competent, and dangerous villains, instead of the comic relief they’ve turned into in subsequent years. He starts off as kind of a smooth talker, but after a few too many thunder shocks from Pikachu, he’s since become easily overwhelmed and expressive about it. James may not be the most powerful trainer in the world. He’s certainly not going to be winning gym badges any time soon. He doesn’t have to be a strong trainer; he’s got a strong heart. 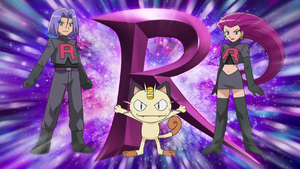 Aside from his Koffing at the beginning of the series, and any obtained off screen, James generally befriends his Pokemon, and asks them to come with him. He feeds, helps, or takes care of them, and they love him for it. Heck, Mime Jr pretty much forces his way onto the team, all the while being treated like gold. That’s the kind of guy you bring home to mom. When he’s not hatching evil schemes, James has a rich, geeky, personal life. He collects bottle caps. He’s a great Poke Ringer. His best skill lies in his cosplay. He’s been Professor Oak, Juan, Jessie, and many others. He’s got the outfits, as well as the nuance of the person he’s portraying. Something always manages to go wrong and reveal the truth, but until then, people think he’s the genuine article. Since it’s a kids show, the topic of his sexuality doesn’t really come up, but there’s evidence that James is a little light in the loafers. He’s got a fiancé that his parents arranged, but he has no interest in. Or any woman really. 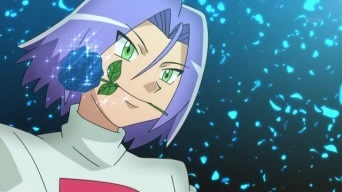 Yes, there’s a not so dark corner of the internet full of Jessie and James couple pictures, but there’s nothing to back up they’re anything more than good friends. James is sensitive, caring, compassionate, and good with animals. Everything you’d want in an animated boyfriend. Or a real one. Hey! I could get a real one. If I ever left the house. Like you’re so great. Love ya! Until next time, stay geeky and keep gabbing!